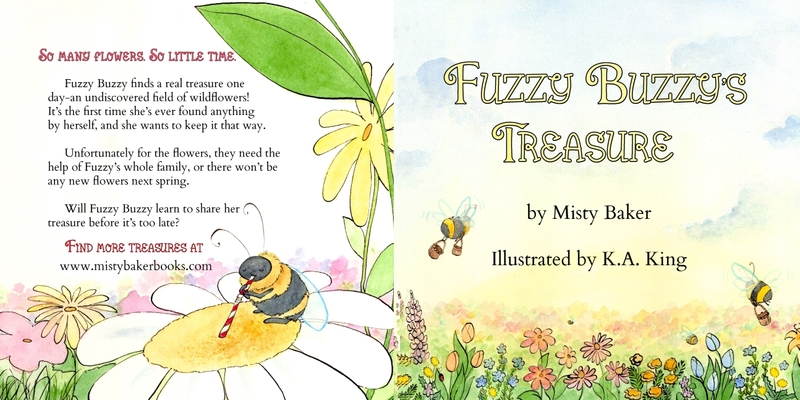 At long last, Fuzzy Buzzy’s Treasure is buzzing to life and available now in print on CreateSpace! It’ll be up on Amazon in the next 3-5 days. I’m very happy with how it turned out and I want to again say THANK YOU to all the wonderful sponsors who helped me give Fuzzy Buzzy her wings. I’m planning to donate a portion of the proceeds to the Xerxes Society for bumblebee conservation, so your purchases and donations will go to a great cause! And here is a look at the cover spread. It’s so pretty, don’t ya think? < Previous More Little Pirates Joining the Crew! Next > We’re all buzzing over Fuzzy Buzzy!